Rodent damage to insulation and vapour barrier. A Gibsons home inspection of the crawl space identified an active rodent infestation. Certainly not our favorite location to check but essential for what it identifies. The rodents have been busy. 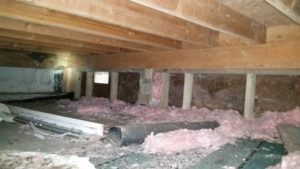 What was once pink fiberglass insulation placed between the floor joists, was now just pink mush lying on the crawlspace floor. For good measure the vapour barrier covering the earth floor had also been well chewed up. The buyer has some work ahead of them. The damage did not happen overnight, as the condition has existed for years. It never pays to ignore a condition, as the remediation only gets more expensive. Fortunately for the current owners, they had not had any health related issues or rodent entry into the house. But that was luck and only a matter of time now. For the buyers, it’s a pause for serious reflection.